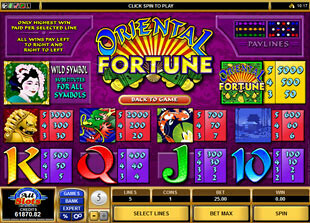 Oriental Fortune Slots is 5 reel, 5 line video slot powered by Microgaming. Just sink into the Chinese culture and fiery dragon symbol will bring you luck and will help you to win top jackpot of 5,000 coins or $25,000. This captivating slot exists in no download format, so, no special software installation is needed to play it. 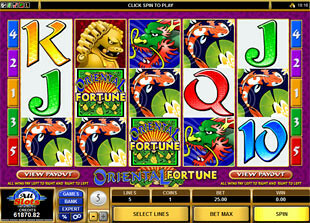 Oriental Fortune Slots has following Chinese symbols: Geisha, Oriental Fortune Logo, Golden Statue, Dragon, Fish and House. Before to make these reels spinning, choose one of the following coin sizes: $0.25, $0.50, $1.00, $2.00, $5.00. The minimum bet constitutes $1.25, the maximum one is $25.00. The highest Oriental jackpot is 5,000 coins or $25,000 for 5 Oriental Fortune Logos. The second Oriental jackpot is 3,000 coins or $15,000 for 5 Golden Statues. 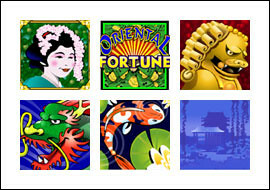 The third Oriental jackpot is 500 coins or $2,500 for 4 Oriental Fortune Logos. The wild symbol of the game is Geisha. This symbol plays particular role on the game because it can replace other game symbols to form complete winning combination. Note that in this game all wins pays left to right and right to left as well. Oriental Fortune slot machine is magnificent video game with Chinese theme, super bright graphics and top jackpot of $25,000.